See our book section below. "How can you say these are consenting adults when they have no education, no exposure to the outside world, and polygamy is the only life these women have ever known?" These photos helped convict Warren Jeffs! Click here for the Huffington Post article. Photo of former FLDS leader Rulon Jeffs with two of his wives. They seem to present a happy picture here. But is it reality? It has been reported that Mr. Jeffs left behind seventy-five widows at the time of his death in 2002. Recent events have created a wave of fascination with the idea of a man taking more than one wife for himself. By now you may have had a chance to read a magazine article or watch a television program that examines the lives of men and women who have chosen to enter into polygamous marriages, or "plural marriage" as it is sometimes called. 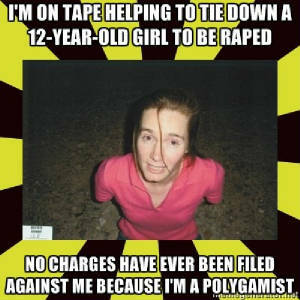 In the programs that I have had the opportunity to watch, the polygamists portray an unusually happy and lighthearted lifestyle burtsing with caring and sharing. Just one big happy family! One special investigated the polygamous lifestyle of a fair-sized religious colony. A family of young, fresh- faced women sat surrounded by their many children as they spoke of the virtues of plural marriage while their husband sat listening nobly in their midst. But when pressed for more information about her feelings, the youngest wife hesitated and blushed. "It's really beautiful," she manged to repeat several times. A middle-aged woman presented a calm and contented image as she discussed the most recent marriage of her husband to a pretty, olive-skinned girl younger than her own daughter. She thoughtfully proclaimed that the only discomfort she experienced about the new marriage was that sometimes she felt a little left out - but not very often. Do you have trouble believing that? I do. I grew up in that church. I saw the other side of the story. I saw heartache and jealousy and, often, neglected children. Indeed, this seemed to be a world made up mostly of women and children. The men, who were vastly outnumbered, kept busy with work, church affairs, farming... and dating prospective new wives. I watched my friend weep on her husband's shoulder at his wedding before he left for a honeymoon with his lovely new bride. I saw pretty young girls ardently courted, made to feel like queens, as older wives looked on with brave faces. Then, when one of my friends finally married a man who had courted her for years, she soon found herself going through a severe depression. It seemed that her husband wasn't as interested in her anymore now that he had her. She also noticed that certain wives got more attention than others, and by the end of their first year of marriage her husband was already courting one of her best friends. Me. Yet another friend offered me some disheartening advice for the future. "Act witchy and demanding, and you'll get more attention," she promised. "When you are cooperative and civilized, your husband won't notice you as much." I saw women struggling day-to-day raising large families almost entirely without their mates. And although most of the women tried to get along, I heard gossip about occasional cat-fights between neglected, stressed, and jealous wives. With such large families, it was hard to give or get individual attention, and often young children were given adult responsibilities. Their fathers were more like visitors coming and going from their lives. Rarely did they have the opportunity to spend time with the children, and as result did not really know or understand them. I suppose it would be fair to consider the good points of plural marriage. Most of them are in the men's favor. For instance, the men are never lonely. How could they be with so many women and children vying for their attention? And if one wife died or left a man (which wasn't uncommon), there were always a variety of other women to replace her, greatly easing his sense of loss. Another nice thing for the man was that his women tried to look their best for him when he was around. Competition keeps you on your toes! And I noticed that some men even went to another wife's house if a child kept him awake crying in the night, or if the wife he was visiting gave him too much trouble with complaints or arguments. I suppose they felt entitled to some peace and quiet from the stress and pressure of dealing with so many women and children. And there was the matter of making sure that they all had housing , food, and clothing. However, that brings me back to another negative point: Not all women and children had proper food and clothing. Luckily for the man, his wives were usually willing to help with that difficult aspect of plural marriage by leaving their children with the husband's other wives to help support the family network. A woman could easily get on "Welfare" too. What are some of the other good points of living polygamy? One important virtue, according to the people of my former colony, is that women learn to share while denying their selfish desires- like having husbands of their very own. For some reason, it's not important for men to learn this virtue. Of course one of the main reasons for living polygamy in the old days, was to populate an area in a very short period of time, and there raise up children to serve God. But if we put aside all religious reasons for choosing to live polygamy, what are the practical reasons for a woman to live such a lifestyle? I don't know. I can't think of any. That's why I chose not to live it. Instead, I decided to have a husband of my very own. We share one house, one family, and numerous joys and sorrows. When problems arise, he's there to help work them out. Together. Like partners. I like it better that way.